The challenge for McCormick & Schmick’s was even though the stores shared a consistent restaurant model, they operated as autonomous entities with individual and daily changing menus. It was extremely difficult to compare and understand current and historical sales as well as other key business drivers. Their previous method for business analysis required gathering data from disparate systems and consolidating it into a 70-page Microsoft™ Excel document. McCormick & Schmick’s Seafood Restaurants needed better insight to understand and take advantage of key business trends. 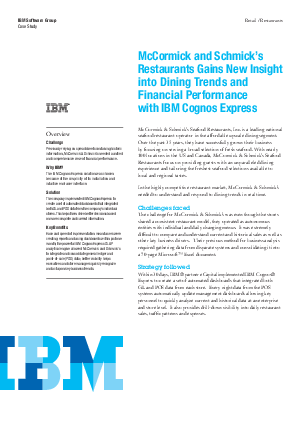 Find out why they chose IBM Cognos Express to deliver that insight and what it means for their success in a fiercely competitive market space.